Following on from yesterday's review of Sink \ Sink's latest album "A Lone Cloudburst" ... I thought I'd find out a wee bit more about Gareth Schott ... the man behind the band. I'm glad I did ... because I found out one of the musicians in the band - Micah Templeton-Wolfe - records under the pseudonym Stray Theories ... whose album "Even Though I Sleep" is one of my all-time releases. I hope he'll agree to be interviewed too ... sometime soon. 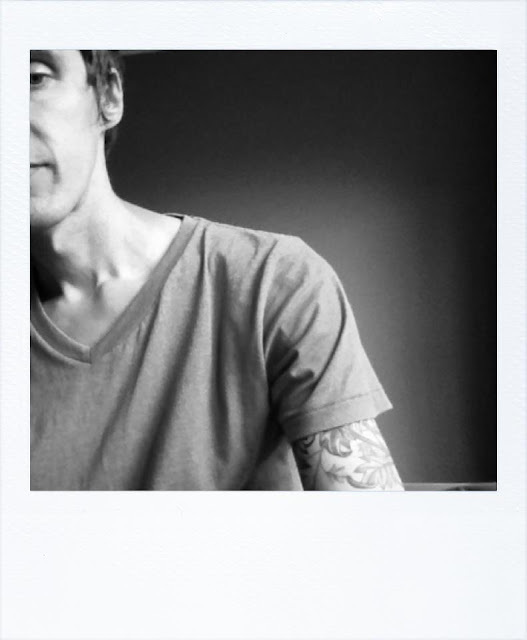 I am Gareth, I write and record as sink \ sink an ambient shoegaze band from Aotearoa, New Zealand. While I never work alone, I drive the process writing and recording material which I then often build up in collaboration with other artists I respect and admire. I enjoy the freedom of not having a conventional band and being forced to have the same instrumentation from start to finish on each song. My only vice is the cello and I have a permanent cello player in Catherine Milson, who is wonderful to work with. Well, we have literally just released our second album, 'a lone cloudburst' on tape via Already Dead Tapes (US) and digipak via Susy Records (Peru), which was recorded second half of 2012 and mixed first half of 2013 by Sean Erin Lynch, a New Zealand musician. We are excited to see how people respond to the album. I am also involved in a spoken word project as Cautionary Tales for Children with sink \ sink's original singer Jamie Dryden, a Scot, who writes and performs spoken word pieces about life in Glasgow. We are aiming to release an EP of these soon. sink \ sink's next project is a soundtrack piece that is hopefully going to be used by NZ filmmaker Julia Reynolds for her latest short film. We are kind of helping her out at this stage helping her clarify what she wants for her film. Hoping to persuade her that she wants our music! Kevin Shields is an obvious one given our style of music for his independence and unique approach to music. Loveless has never lost its impact for me. NZ inspires me daily. It's my adopted country. It's a country where you can do anything. There aren't people blocking you or holding you back. I have been my most creative here more than anywhere else I have ever been. It's a get on and do it culture. I have always had songs in me, but I have always been in bands with other people. People that I have felt the need to please, musically at least. With sink \ sink I am only answerable to myself and how far I can take the sound I seem to have developed for myself, which other people identify immediately as sink \ sink. Now it is a matter of how far can this go, where can I take it. People are so kind and seem to really like what we do, not on a massive scale, but a more personal level that really makes it worth it. Movement away from showmanship, performance, ego. Allowing others to come in and be themselves, letting the material develop with the input of others, without stifling that or controlling it. We always strive for beauty and emotion ultimately. Everything, it is immediate and it is a connection. I give and take support from so many people without whom I probably wouldn't have the drive to keep doing what I do. I have been so fortunate to work with so many lovely and talented people from Kim and Callum on the first sink \ sink album, both of whom I continue to work with in different forms to Micah Templeton-Wolfe aka Stray Theories whose work I so admire that I have a hard time believing he is willing to work with someone as lo-fi as me. Who knows? We will see how the new album is received and then go from there. There is never a plan or concept when I sit down to write, it is usually improvised over the course of a few hours then knocked into shape from there. What that is going to sound like is anybody's guess.